Lessons in Life! : Or alternatively - have faith! Annual General Meeting 2017: BVAA�s Annual General Meeting was held this year on November 17th at Rookery Hall, Cheshire. Valve Industry Shrugs off the Beast & Emma! BVAA Courses Certified for CPD: Another benefit of enhancing your valve knowledge with the BVAA! Electric-Actuated Subsea Regulator: Late last year we were approached by one of our customers who was struggling to find an assembly solution to their deep sea application. Cambrian take the Pain out of Valve Selection: Cambrian Valves � part of the Great British Valve Group - has recently expanded in all aspects of its business. Challenge of Monitoring Shut Down Valve Condition on Existing and Ageing Assets: Shut down valves perform a vital safety role on many process plants, both onshore and offshore. Valve Corrosion - Why is this So Important when Considering The Choice of Valve Packings? Flow Control Solutions: Unrivalled solutions from Flowserve�s largest independent distributor in the UK. Acquisition adds Valves Value for EnerMech: EnerMech is expanding its valves division with the acquisition of the UK valves business of Denholm Valvecare (DV). 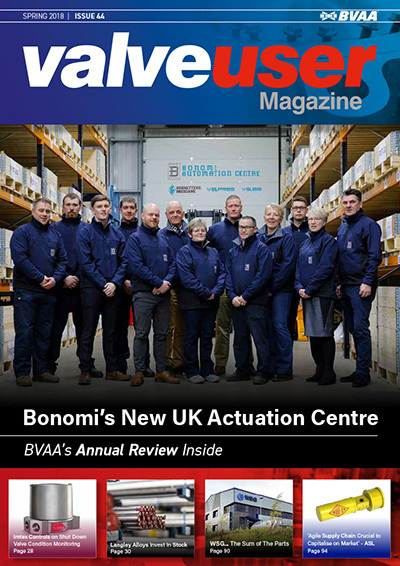 NEW Process Valves & Actuation Catalogue from Hydravalve (UK): The comprehensive 600+ page catalogue showcases renown European and worldwide brands and new product lines. AVA Actuators Continues its Growth & Development with New Partners around the Globe: AV Actuators has had another year of growth and development of its range of quarter turn electric actuators. 140-Year-Old Valve Refurbished & Re-manufactured: Blackhall Engineering Ltd save critical valve from failure, in one of Yorkshire Water�s oldest reservoirs. SMC Launches Digital Flow Switch For Large Flow: The latest digital flow switch to join the SMC family, PF3A7#H, monitors the consumption of the main line with a 100:1 ratio. Who are BVAA? What does BVAA do? Doing more, with less: Almost all of us have had to deal with that reality in our careers. At BVAA, this is no different. Activities Report: Activity Breeds Activity! Gall Thomson Launches First Locking Camlock: Gall Thomson, the world leader in marine couplings, has just introduced a new range of next generation locking cams for its Camlock Couplings. Ultravalve Wins Contract & Territory Extention Through Vexve Deal Renewal: Bonomi-owned process valve and RPZ valve specialist Ultravalve, has signed an extension to its partnership with Finnish valve manufacturer Vexve. Groupe Latty�s New Gasket Specially Designed For Triple Offset Butterfly Valve: The new gasket LATTYgraf S is a highly tolerance machined gasket specially designed for double and triple offset butterfly valves. WSG ...The Sum of the Parts: WSG UK Ltd all set to shake up the industry approach. New Local Expert For Food & Beverage Sealing Solutions: Dichtomatik UK Ltd becomes the exclusive local provider for Freudenberg Sealing Technologies� food and beverage sector in the UK. WSG Provalve - Proficiency In Safety and Relief Valves: Relieving real world challenges & pressures are all part of WSG Provalve�s day job. ValvTechnologies, Inc.: ITC 2018 Recap: The biennial ValvTechnologies� International Technical Conference and Users Group (ITC) was held on February 8-9 in Houston, Texas. Introducing Alco�s New Website & New Range of High Pressure Products: We are pleased to announce the release of our brand new website which will be launched on the 28th February. Trust ARI For Economical Solutions In Control, Isolation, Safety & Steam Trapping: ARI-Armaturen UK Ltd will be exhibiting on stand BV100 in the �Valve Zone� at the Fluid Power & Systems show at the NEC, Birmingham, 10-12 April. Curtiss-Wright Offers Restricted Lift Options for a Series of Pressure Relief Valve: Curtiss-Wright�s Industrial Division offers restricted lift options for the Farris 2600/2600L series pressure relief valve. The Distributor�s Distributor: Leengate Valves are further proving their commitment to supporting their network of distributors. Allvalves Enjoys Consecutive Year-on-Year Growth & Adds Another Major Brand to its Offering. : Now it�s their 7th year, Allvalves Online Ltd are seeing continued growth with 2017 being another successful year for the company. Need Precision Valve Engineering? Try the Experts: We value hugely experienced suppliers because they have the knowledge & skills to do a quality job in even the most challenging circumstances.